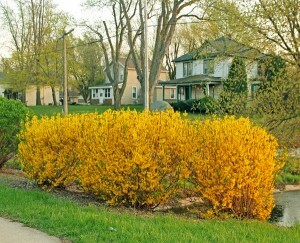 Forsythia is a common landscape plant in the Midwest. Forsythia is both the common and genus name of a group of deciduous flower shrubs in the olive family (Oleaceae) named after William Forsyth, a Scottish botanist who was at that time Director of the Royal Garden at Kensington and a founding member of England’s Royal Horticultural Society. The 11 or so species are primarily native to eastern Asia, with one species from Europe. The two quite variable species F. suspensa and F. viridissima were the first to be brought from the Far East to Europe. Forsythia × intermedia is a hybrid of these species that was introduced in continental Europe about 1880. Many other crosses using the same two parents have been made so plants with this name can be quite variable. F. suspensa tends to have a widely open to drooping habit, but a more upright form found in China in 1861 was given the (incorrect) name F. fortunei. Other species discovered in the early 1900’s – F. giraldiana from China and F. ovata from Korea – as well as the European species F. europaea, have been used in 20th-century American crosses. Hardiness varies by species, with most in zones 5-8, but many of the hybrids are hardier than the parents, surviving in zones 4 or even 3. White forsythia, Abeliophyllum distichum, in bloom. The unrelated white forsythia, Abeliophyllum distichum, has many of the same characteristics as forsythia, blooming about the same time, but with white flowers. Forsythia are vigorous deciduous shrubs with a mounded or upright habit. 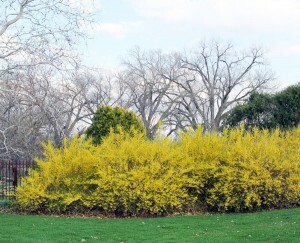 Forsythias are fast-growing, vigorous deciduous shrubs with rough grey-brown bark and opposite leaves. Depending on the type, they can grow 8 to 10 feet tall and 10 to 12 feet across and have upright or graceful, arching branches for a rounded, mounded or upright habit. Plants tend to be more open, with a straggly growth habit, when young, but soon mature to a rounded, thick, and semi-pendulous growth habit. Clumps slowly increase in size as the plants produce numerous stems, often growing beyond its intended boundaries. The flowers are produced early in the spring, before the leaves emerge, for a welcome show of bright yellow blooms (F. suspensa has paler flowers). Plants in the upper Midwest typically bloom starting in late March to mid-April for one to two weeks. The bell-shaped flowers are produced in small clusters or groups along the stems. Each flower has four petals joined only at the base. In rainy weather the flowers hang downward. Like other early blooming shrubs, forsythia blooms on old wood – the flower buds develop during the summer and fall on the previous year’s growth. The flower buds are fully formed by autumn, so unusually warm weather at the end of autumn can induce some to break dormancy and bloom at the wrong time of year. Forsythia is easily forced indoors in the early spring. Flowers are followed by non-ornamental, tan to brown fruits that are a dry capsule, each containing several winged seeds. Forsythia blooms in early spring (L), with many flowers (LC) in clusters along the stems (RC). Each flower has four petals (R). Although the plants are hardy into zone 4, the flower buds are marginally hardy under true zone 5 conditions (minimum temperature of -10 to -20 F). The dormant flower buds of non-hardy cultivars are frequently winter-killed in cold climates. Buds start to be killed when temperatures fall to -5 F, except for cultivars with bud cold hardiness. After harsh winters plants often bloom only below where snow cover insulated and protected flower buds. 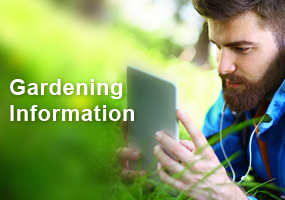 The University of Minnesota has tested the cold hardiness (to -33°F) of many cultivars. 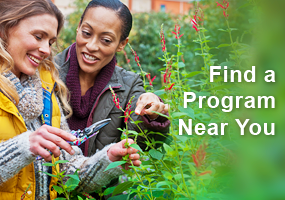 Choose cultivars that are flower bud hardy to provide more reliable bloom in zones 5 and lower. 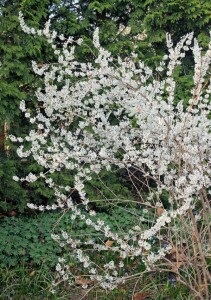 Even flower buds of cold-hardy types may be killed occasionally during mid- or late-winter thaws. As the flowers begin to fade, the separate leaf buds begin to open. The smooth, medium to dark green ovate leaves are usually simple, with the margins coarsely-toothed or entire with no serrations. Forsythias are often one of the last deciduous shrubs to drop their leaves in fall. Sometimes the leaves turn yellow, gold, or purplish in the autumn, but fall color is usually poor. Forsythia through the seasons: early spring (L), late spring (LC), summer (C), fall (RC), and winter (R). Grow forsythia in full sun and almost any type of soil (although it prefers moist conditions and clay to loam soils, but cannot tolerate wet soils). Plants in partial shade will not flower as well and may have more straggly growth. Forsythia can be used as a specimen, in a mixed border, as a background for a perennial bed, or many planted together as a hedge. With their fast growth and dense foliage once they fully leaf out, they are suitable as a seasonal privacy fence for summer and fall. Low-growing cultivars can be used as groundcovers. It can also be limbed up into small tree form. Place the plants were they will have plenty of room in which to grow and expand so they will not need excessive pruning that will remove the drooping branches and spoil the shape of the plant. Forsythia is stunning in spring, but has little ornamental value in other seasons, so should be sited appropriately. 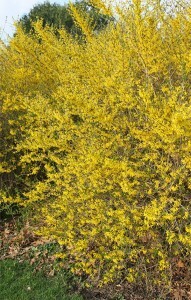 Forsythia has few pest problems, and is not favored by deer or Japanese beetle. Forsythia is stunning in spring. 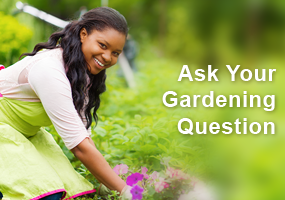 These are vigorous plants that require regular pruning to remain attractive and flower well. They should be pruned soon after flowering, as later pruning will remove flower buds for the following year. Remove one-fourth to one-third of the oldest (largest) stems at ground level every other year once they are established. Neglected, overgrown plants can be severely cut back to within 3 to 4 inches of the ground in late winter or early spring and should regrow quickly to bloom within two years. Forsythia can be grown from seeds, but commercial propagation is usually by cuttings taken after flowering in late spring to early summer. Plants can also be layered, or low hanging stems that take root can be removed and transplanted. ‘Bronxensis’ – is a low-growing (1½ to 2 feet tall) cultivar of F. viridissima that is often used as a ground cover. Its flower buds are not hardy unless covered by snow and it is difficult to propagate. ‘Fiesta’ – has variegated foliage on a compact plant (3 to 4 feet tall). Gold Cluster™ – is a compact variety that only grows 3-5 feet tall without regular pruning. Gold Tide™ (‘Courtasol’) – this dwarf cultivar of F. × intermedia has a more prostrate growth habit (1½ to 2 feet tall), so it can be used as a ground cover or foundation planting. Its flower buds are not very hardy, but will flower where reliable snow cover protects the buds. It came from seed of plants of ‘Spring Glory’ that were irradiated with gamma rays in France. It was given the Royal Horticultural Society’s Award of Garden Merit in 2002 under the French trade name of Maree D’Or. ‘Happy Centennial’ – is a low-growing (30” tall) cultivar developed at the Ottawa Experiment Station in Canada, with light yellow flowers. ‘Lynwood Variety’ or incorrectly ‘Lynwood Gold’ – is a sport of ‘Spectabilis’ that was discovered in a garden in Northern Ireland and introduced in 1935. It was given the Royal Horticultural Society’s Award of Garden Merit in 1993. ‘Meadowlark’ – is a hybrid of F. ovata and F. europaea introduced by North Dakota State University, South Dakota State University and the Arnold Arboretum in 1986 that has bright yellow flowers and excellent flower bud hardiness (to -35°F). It can grow quite large (13 x 15 feet tall and wide) with a sprawling, unkempt growth habit if not pruned. ‘New Hampshire Gold’ – developed in New Hampshire, this cultivar is only 5 feet tall and has hardy flower buds (to -33°F). ‘Northern Gold’ – is a Canadian introduction of F. ovata × F. europaea with yellow gold flowers and good flower bud hardiness (-30°F). It grows 6-8 feet tall. ‘Northern Sun’ – is a cultivar of F. ovata × F. europaea with medium yellow flowers from the University of Minnesota with good flower bud hardy (to -30°F). ’Spectabilis’ – this cultivar of F. × intermedia introduced in 1906 combines the stiffer habit of F. viridissima with the more profuse flowering of F. suspensa var. sieboldii, with clusters of vivid yellow flowers each 1½ inches across. ‘Spring Glory’ – is a very florific F. × intermedia cultivar discovered in Ohio in 1930,and introduced by Wayside Gardens in 1942, but it has poor bud hardiness (only to -10F). ‘Sunrise’ – is a compact, semi-spreading Iowa State University introduction that only grows 5-6 feet tall with a dense growth habit. Its flower buds are hardy to -20°F. If you can protect the plant from deer when it is a new tender plant, we find deer will leave it alone as it becomes more mature and woody. I look forward to it blooming after the long WiI winter. This article answered my exact question of when to prune, right after flowering. 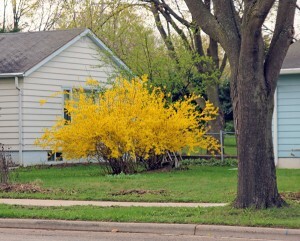 My forsythia does really well in northern Door County but needs to be brought down a bit. I love the forsythia blooms and found this article interesting regarding keeping the bush in shape. However, contrary to what the article suggests, we do have problems with deer. This impacts the spring bloom greatly. I was wondering if the article would suggest wrapping the bush in burlap if possible. I was looking for a deer resistant shrub. I was interested to know whether it was a native to North America but read that it originally came from Asia and Europe. However Minnesota, N and S Dakota and Canada are creating cultivars that have bud hardiness and will bloom with bright yellow flowers in the spring. Pruning can be done after flowering if needed. It’s also a fast growing shrub but can become quite unruly. I think the arching stems make it a beautiful plant. Stunning is certainly the word to describe these plants in full bloom. Was surprised you could cut them back to 3 inches to revitalize the plant. I have a forsythia bush that has been basically growing wild for a couple years. I appreciate learning the techniques for pruning it right after flowering and removing 1/4 to 1/3 of the oldest/largest stems every other year. I may try pruning it back to 3-4 inches from the ground to give it a new start. Forsythia looks like a wonderful flowering plant to start the spring season. I may try to find the Meadowlark. It should be hardy for our Wisconsin winters. Didn’t know Forsythia was a member of the olive family. White forsythia…who knew! So many varieties one should be able to find the perfect one. With the correct cultivar they will grow great at the top of zone 4 even with killing frost. You mention pruning, start early and keep it up or you will have a small tree, allow plenty of space if you want a a very large shrub.